← ..Hellooo ?……thats a serious-looking……..Beak !!…….. 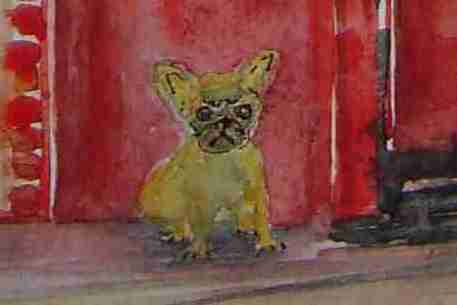 This entry was posted in Sheffield - watercolours and tagged Antiques, Ecclesall, Exhibition, Fifi, French Bulldog, Furniture, Gilberts, Pine, Sale, Sharrow Vale, Watercolour. Bookmark the permalink. 7 Responses to Cute French Bulldog……..
Don’t chicken out! Hoping your day will be wonderful. Hope the weather and all worldly elements cooperate to make the show fun for you! Many Thanks L, replies Victoria, who is having difficulty getting a word in edgeways on her own blog ! It has been warm in London. Hope you can survive the heat. Next stop Australia if you can! all the best out there Victoria.